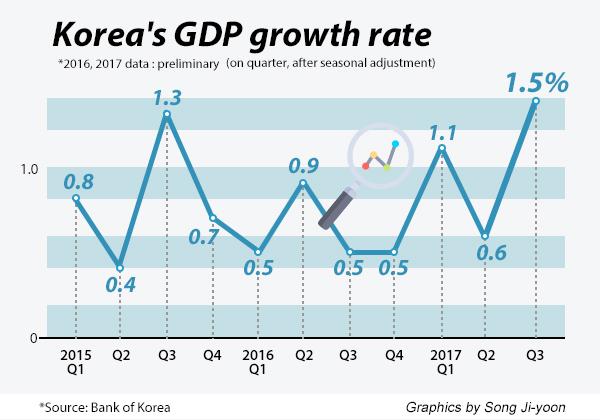 The South Korean economy proved to have performed ever better than the surprise pace of 1.4 percent in the third quarter, expanding by the fastest rate in seven years as robust exports helped to lift consumer and corporate spending. According to revised data released by the Bank of Korea on Friday, the country’s real gross domestic product totaled 392.5 trillion won ($360.7 billion) in the third quarter ended September, up 1.5 percent on quarter in the biggest quarterly expansion since 1.7 percent of the second quarter in 2010. Against the same period last year, the economy expanded by 3.8 percent. Unless the economy contracts in the final quarter, it is expected to register an annualized growth rate of at least 3.2 percent. The main Kospi finished Friday at 2,475.41, down 0.04 percent. The Korean currency closed at 1,136.4 won against the U.S dollar, up 1.8 won from the previous session. The bank said quarter-on-quarter growth in private consumption was revised up 0.1 percentage point to 0.8 percent as expenditures on services and non-durable goods rose ahead of Chuseok, one of Korea’s biggest holidays. Facility investment growth was also revised up by 0.2 percentage point to 0.7 percent. Exports grew 6.1 percent - highest in six and half years and unchanged from the earlier estimate - on strong demand for semiconductors, chemicals, and automobiles. 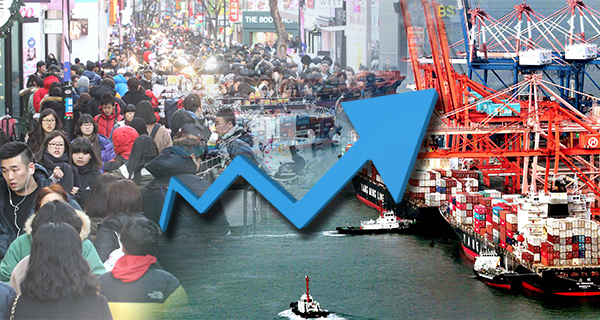 Import growth was revised up 0.2 percentage point to 4.7 percent due to higher oil prices. Exports and imports had shrunk in the second quarter by 2.9 percent and 1.0 percent, respectively. Manufacturing output expanded by 2.9 percent, adjusted upward by 0.2 percentage point to mark the biggest growth since second quarter 2010. Service sector output expanded by 1.1 percent, revised up from previous estimate of 0.9 percent and recorded the fastest pace in three years. The gross national income (GNI) also grew 2.4 percent on quarter to 411.4 trillion won. GNI is the sum of all goods and services a nation produces plus income received from overseas. The central bank on Thursday delivered its first interest rate hike in more than six years, citing recovery in the economy, but nevertheless vowed to maintain an “accommodative” monetary stance to support economic growth.